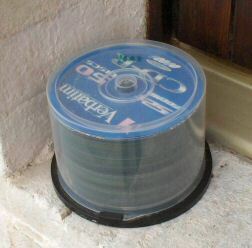 This time I collected a bunch of 44 CD-Rs including either data or audio tracks, all in good condition, correctly burned, which I enclosed in a cakebox, with some paper discs above them (see below), so not to leave them exposed to rain or other hazards. I left them outside a window, directly facing south, for more than seven months (from August 2, 2005, until Feb. 8, 2006). They were subject therefore to strong sunlight, and to some degree of moisture, deriving from rain & snow (which however didn't hit directly the box). Temperature, around the end of January, used to fall below zero at night. The cakebox had never been turned, or moved, and thus the discs had been facing the sunlight from the same direction, for the whole period. I did not test the discs before the "experiment". Thus, direct comparison can't be done. However, I submit that all discs had been correctly burned, and that all data/tracks could once be easily read by any drive. I mean that I didn't use bad burns or otherwise damaged discs. All discs were apparently in mint condition (i.e., no scratches). Here are two photos of the cakebox "in place"
On top and bottom of the CDs I placed some transparent plastic discs as well as some rings and paper leaves to try to keep all CDs in the same conditions (otherwise the discs on the bottom would have been somewhat repaired by the cakebox, while those on the top would have suffered a higher exposure to sunlight). Discs were placed in the cakebox randomly (that is - not grouped according to brand, type, etc.). On top of the CDs, just below the first transparent disc, I placed one DVD, which, after the test, resulted to be only partly readable. All CDs had been written by an L.G. GCE-8525B (52x32x52x) either at 8x or at 16x. Another disc also belonging to the "long strategy die" class, the Sony Supremas (ATIP 97.24.11), changed its blue-ish color in a very impressive way (like Princos used to do), but it could be read without errors. All other discs, belonging to the "short strategy die" type (those with a yellowish-light green media), do not show any kind of decay, apart from the MAM-Es (including the audio SG-Ultra, see next lot) that show a slightly yellowed label, which apparently did not affect the media. All CDs had been written by an L.G. GCE-8525B (52x32x52x) at 8x (the lowest allowed speed, thus in CLV mode) with E.A.C. Audio was extracted with E.A.C. (Default mode) using a Hitachi CDR-8335. This drive is rather old (it's a 12x) and quite sensitive to reading problems (it easily shows slower extraction speeds with bad media). It is capable of extracting audio from mint discs at 5,0-5,2x. Here I give both the average extraction speed calculated by E.A.C. and the reported "track quality" (rounding it to the lower value, this means that a 100% means all tracks were extracted at 100%). 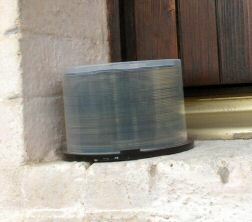 I experienced that in many cases the outer part of the discs was more difficult to read. In some cases, the discs were extracted at 4x-5x speed up to about 60 mins of music, while thereafter extraction speed fell dramatically. Looking at the above table, one may notice that, in many cases, shorter discs have much better reading speeds. * Extr. speed 2,2x up to last two tracks - track quality 100% for the first 61 min., last two tracks 99,2% and 98,9% resp. ** Extr. speed 2,2x up to last two tracks - track quality min. 99,9% for the first 68 min., last two tracks 98,9% and 96,9% resp.